Blog > Poker Strategy > Tournament Poker Strategy > Why Play Poker Tournaments? 1. They provide the opportunity to invest a relatively small amount of money to win a big payout. There is a wide variety of Poker Tournaments. You can challenge yourself to win a single table tournament a.k.a sit and go (SNG), or move up to as many players as you’d like to beat out. You can do freerolls, small buy-ins, satellites to win seats in huge tournaments, or just flat out buy your way into a huge tournament. 2. There are also great online poker freeroll tournaments all over the place. Poker Tournaments allow people to work there way up with less risk than just sitting down at a cash game. 3. Poker tournaments can be exciting, lucrative, and very valuable in gaining experience in the game of poker. The game you want to learn may not be offered at betting limits that are comfortable for you. If you enter low-buy-in tournaments, you can get plenty of play for a small amount of money and have the opportunity to build your bankroll from the ground up. 4. Poker tournaments are arguably more pure than cash games. More of your opponents are apt to play by the book in Tournaments because they know that once they lose their buy in, their tournament play is over. 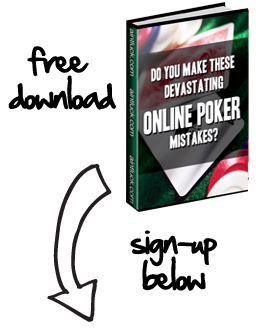 This allows new players a better opportunity to see how poker theory works in practice. 5. Tournaments are a great way to match your skill with some great players, particularly in higher buy-ins of course. It’s a confidence booster to sit at the same table with some big-name opponent and finding out that he or she faces the same challenges that you do. 6. Poker Tournaments come in Many varieties ranging from huge fields of up to 10,000 players down to a small six player sit and go tournament. 7. The World Series of Poker and other televised poker events are tournaments. Wouldn’t it be awesome to play in and do well in one of those? Of course, we don’t deny you’d have to get pretty lucky to cash in with the massive amount of players that enter.